Brené Brown must have thought this was a good summary of her book, because this is the quote she used in the epilogue. It’s also the title of the book, DARING GREATLY. And as the quote alludes to, it is about the paradox of being seen as great and heroic through vulnerability and effort. 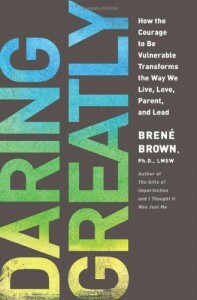 The buzzword lexicons for this book include: shame, scarcity, and vulnerability. Brown claims to have done a high amount of research (I have no doubt that she did) to deduct her findings, but a lot of this seems lumped together in her catchphrase buckets. But does it work? Sure. Overall, I like the premise of this book: to know there is plenty to enjoy and do now, to live and connect with people, to be who we are, to engage, and so forth. A lot of this is not new, but may be gaining momentum from her TEDx Houston talk. Her section on parenting reminds me of recent books like HANDS FREE MAMA and IF I HAVE TO TELL YOU ONE MORE TIME. The bottom line is: we all want to feel connected to one another and sometimes we have to be vulnerable enough to take risks to gain that connectivity. Is this book worth reading? Yes, I believe so. Brown does a great job of defining the walls we put up (or, Shields, as she calls them) and how we can get back to what drives us the most.